Joule heating is ubiquitous in electrokinetic separations. This review is in two major parts. 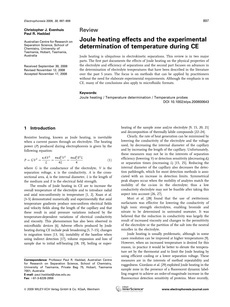 The first part documents the effects of Joule heating on the physical properties of the electrolyte and efficiency of separations and the second part focuses on advances in the determination of electrolyte temperatures that have been described in the literature over the past 5 years. The focus is on methods that can be applied by practitioners without the need for elaborate experimental requirements. Although the emphasis is on CE, many of the conclusions also apply to microfluidic formats.